Attending Tiger Jam not only gives guests an experience of a lifetime, but the venues, amenities, and vibe of this event is unlike any other Vegas weekend. From the golf outing and tournament at Shadow Creek to the evening attractions at the MGM Grand, each element of this two-day event is truly extraordinary. MGM Grand Hotel and Casino is “The Entertainment Authority,” creating the ultimate Las Vegas experience. From golfing at Shadow Creek to the Topgolf post-party and everything in between, get the ultimate Tiger Jam experience at the MGM Grand. Descriptions of Shadow Creek do not do this course justice. Shadow Creek must be played. Shadow Creek must be experienced. Only then will true lovers of the game be able to appreciate its beauty. Play your cards right and knock out the world’s top poker players and celebrity guests at Tiger’s Poker Night presented by World Poker Tour. This invitation-only event within the MGM Grand allows guests to go all-in for charity, while experiencing a poker tournament that sits at a level of its own. From rock stars to pop artists to country musicians, the Tiger Jam stage has brought talent from all genres to perform in Vegas in support of TGR Foundation. Guests experience VIP access to the best seats in the house while dancing the night away before heading to the epic post-party. Meet Tiger Woods. Play with a PGA TOUR professional. Spend the day with a celebrity or professional athlete. Grow your collection of luxury items. Win your dream package and travel the world through the Tiger Jam auction. The 20th Tiger Jam brought hundreds of people together at the MGM Grand Hotel and Casino in Las Vegas for two days of golf and fun, raising funds for the TGR Foundation. Professional athletes including Reggie Bush and Larry Fitzgerald took to Shadow Creek alongside golfers like Paige Spiranac and Blair O’Neal, while poker professionals such as Maria Ho and Phil Hellmuth went head to head with guests at Tiger’s Poker Night presented by WPT. 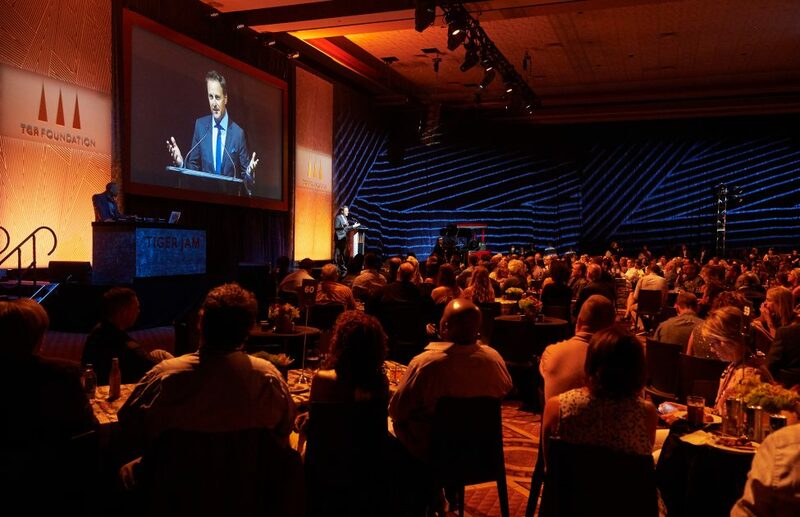 Saturday evening welcomed Chris Harrison and Sugar Ray Leonard to the auction stage, while a speech from Earl Woods Scholar Desiree Sim won the hearts of every guest in the room. Multi-Grammy and Billboard awards winner Train rocked out with guests poolside, followed by the ultimate post-party at Topgolf where Tiger Woods challenged guests and celebs to friendly competition. The 20th Tiger Jam was a huge success for TGR Live and the TGR Foundation, raising awareness and funds for the foundations college-access and STEM programs. Tiger Jam returned to Las Vegas for an epic two-day charity event at the MGM Grand Hotel and Casino. Wesley Bryan held a golf exhibition on the range Friday at Shadow Creek, followed by Tiger’s Poker Night, where celebrities like Kate Upton, Chris Paul, and Mark Cuban went all-in for charity. Saturday’s events included a reception and live auction. After dining on decadent bites and bidding on luxury items, guests headed to a private, poolside concert featuring Darius Rucker. Guests capped off the unforgettable experience at the post-party at Topgolf Las Vegas. On April 29 & 30, 2016, Tiger Jam welcomed poker legends, rock stars, celebrities and VIP guests to the MGM Grand Hotel & Casino in Las Vegas. In 2016, Tiger Jam raised over $1 million for TGR Foundation’s college-access programs that help equip students in need with the ability to exceed any and all expectations. Inside of the MGM Grand Ballroom for the Reception and Auction. 2016 was the 20th anniversary of the Tiger Woods Foundation. On May 15 & 16, 2015, Tiger Jam was held for the first time at MGM Grand Resort & Casino and entertained guests with rising musical sensation Ed Sheeran at the MGM Grand Producers Pool. Tiger’s Poker Night was held on the casino floor and brought a crowd to see the A-list of poker legends and special guests going all-in for charity.